The World's Best Ale is Tripel Karmeliet! According to the recently announced 2008 World Beer Awards, that is. Do not confuse the World Beer Awards with the World Beer Cup. One was created in 1996 by beer legend and founder of the Brewers Association, Charlie Papazian. The other was created last year by the 3 year old bi-monthly consumer beer magazine, Beers of the World. Don't get me wrong, its not that I necessarily disagree with their list of winners, but one obviously has a little more credence then the other. Nonetheless, its always interesting to read through the list of "winners" of these types of awards and nod in agreement or recoil in horror that they could have actually awarded that beer. If anything, these awards serve to remind me about beers that I tried once and then never picked up again. And they can also torment me with beers that I've always wanted to try, but have still not had the chance. I'm sure its been years since I actually drank a Tripel Karmeliet. I don't even notice it on the shelf anymore, my eyes passing over it and hundreds of other beers that I've already tried as I search for any new ones that have been able to successfully run the TABC gauntlet. The Beer Enthusiast in me is constantly seeking out new beers while casually tossing perfectly good ones to the side on the chance that the next one could be even better. Unfortunately, not all of them are. So, perhaps its time for a more leisurely stroll through the beer aisle at my local Spec's to pick a few of those gems off the shelf and taste them again for the first time. Or, I can just see what new winter warmers and holiday beers are in early! After of a couple of weeks of watching it ferment first in the primary fermentor and then in the secondary, my Holiday Cheer was ready to bottle this weekend. Its not as dark as I would have liked, but it did indeed ferment out to a respectable 9%. It now needs a good 4 ~ 6 weeks of aging in the bottle, but it should be quite drinkable before Christmas. I sampled it a few times during the process of bottling and the alcohol was definitely noticeable, but it should mellow out a little as it ages. Unfortunately, it will probably be drinking best after the holiday season is long gone. I always plan on brewing my Holiday Cheer earlier in the year to allow adequate aging before the festive season begins, but I never think of it in time and its usually so damn hot here until at least mid-September. Right now would probably be a good time to starting thinking about brewing a good spring time beer, but unfortunately, my beer cellar is already bursting at the seams. I guess that means I'll have to spend the winter months emptying it out. Saturday, November 1st is Teach A Friend to Homebrew Day. Its an international event presented by the American Homebrewers Association (AHA) to introduce people to the joys of homebrewing. Each year on the first Saturday in November, homebrewers around the world are encouraged to invite non-brewing and brewing friends and family to celebrate Teach a Friend to Homebrew Day and brew a batch of beer together. More information regarding the event and the AHA are available at the Teach a Friend to Homebrew Day event page. Why does the TABC hate beer? Rob Walsh of the Houston Press wrote a great article this week titled "Texas Wants Beer". It details the ongoing problems and struggles that Texas micro-breweries continue to have with the various Texas Alcoholic Beverage Commission (TABC) rules and restrictions. A quote from a citizen appointee to the TABC review committee sums up the TABC quite well, "a corrupt system that no longer serves the public interest". 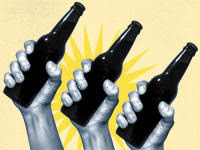 The additional side story from Walsh titled "Texas Wants Beer: Change This Law", describes the worst of the bad beer laws that local micro-breweries would love to have changed, the Texas law that prohibits breweries from selling beer directly to the public at the brewery. Texas wineries were able to successfully change the law a few years ago and now they are able to sell bottles of wine at the wineries, but the eight micro-breweries that now exist in the state do not have the resources or political clout that the wineries have, so the attempts to change that law have so far, failed. They also don't have the resources and more importantly, the influence that the beer distributors have as they're the main opposition to this law getting changed. Although I haven't been brewing at home nearly as often as I used to, I always find the time in the fall to brew my Holiday Cheer beer for the Christmas season. This year, I chose to brew a Belgium Strong Dark Ale, which should hopefully turn out similar to Stille Nacht from De Dolle Brouwers. I was able to do a vertical tasting of the previous three years of Stille Nacht while at the 't Brugs Beertje beer bar in Brugge, Belgium last fall. The aroma and flavour were both sweet and fruity with a bit of spiciness in the finish and a nice warming affect from the higher alcohol. Exactly what I hope my Holiday Cheer will be this year. If it ferments out completely, it should come in at around 9% abv. I was a little disappointed in the Double Chocolate Stout that I brewed last year, but the Holiday Cheer brewed in '05 and '06 have aged very well. I enjoyed a bottle of each while brewing this year's. 472 breweries entered a combined total of 2,902 beers in the competition at this year's Great American Beer Festival (GABF) in Denver. And of the 222 medals that were awarded in the 75 different categories, 3 went to breweries from Texas. Fredericksburg Brewing Company won Gold for their Helles Keller and Uncle Billy’s Brew & Que won Silver for their Hell in Keller in the Kellerbier/Zwickelbier category. And in the Munich-Style Helles category, Saint Arnold took home a Silver for their Summer Pils. The complete list of winners is available at the GABF Website.